Crush the oreos finely and push into crust form at bottom of pan and up about an inch of the pie pan. Chocolate layer: blend tofu and sugar. Double boil the chocolate chips until melted. Add the chocolate chips to the tofu mix and blend. Pour this mix on top of the oreos and place in the freezer for at least 30 minutes. Peanut butter layer: blend tofu, powdered sugar and peanut butter. Pour this mix on top of the chocolate layer. Put in freezer for at least 30 minutes. Caramel layer: Toast the sugar in a small pan on medium high while boiling the water. When the water is boiling, pour the water over the sugar and heat until it bubbles and thickens. 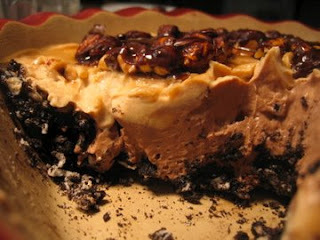 When its at your desired thickness, drizzle the caramel over the entire pie. Place pie in freezer until its time to eat!